So it's that time again. I haven't wrote a style blog post in a while and since I am leaving for New York TODAY (Yup, you heard right. I am actually on a plane right now as you read this), why not write all about the best outfits to wear while traveling? Traveling can be extremely stressful so having the right outfit on can make or break the entire flight (Trust me, I did NOT wear the right thing on my flight to South Africa). One of the best pieces of advice I have received about flying is keep a clothing piece or accessory that has the ability to keep you warm. The three outfits I have chosen to talk about does in fact follow this advice. Instead of blabbing on and on, let's just get to each outfit! The first outfit is for all those who absolutely need to be comfortable. Pairing a simple cami tank top, cardigan, and leggings with comfy combat boots will make for the ultimate travel friendly outfit. The cardigan is used to keep you warm on the cold plane and is perfect for the colder months when arriving and leaving the airport. It's simple yet efficient. Number two is more for the warmer months out of the year. The comfortable plain t-shirt is nicely paired with dark denim shorts and simple sandals. The statement scarf has two functions. It is an extremely fashionable accessory that can complete any outfit and can act as a light blanket to keep the traveler warm. This outfit is perfect for those who are fashionable but want to keep it simple. Last but definitely not least, the third outfit is for those who really want to make a statement. Wearing a maxi dress is the perfect way to cover your legs and to keep them warm, not have to actually wear pants, and be extremely stylish all at the same time. Pairing this with an adorable denim jacket will complete the look, while giving you the option to keep you warm if you're too cold. All of these outfits can be nicely paired with simple or statement jewelry that can complete an entire look. Not too sure where to get the perfect jewelry? Check out Rocksbox! It's a monthly subscription box that gives you three pieces of designer jewelry on loan, like the Kendra Scott Earrings pictured above. You can get your first month entirely free with no obligations by using the promo code "earthtokacexoxo"! These are just three of the many outfit options for traveling. I firmly believe it is extremely important to feel stylish and beautiful as well as being comfortable, because it can really affect your flight. I hope you enjoyed this short little post I decided to whip up! 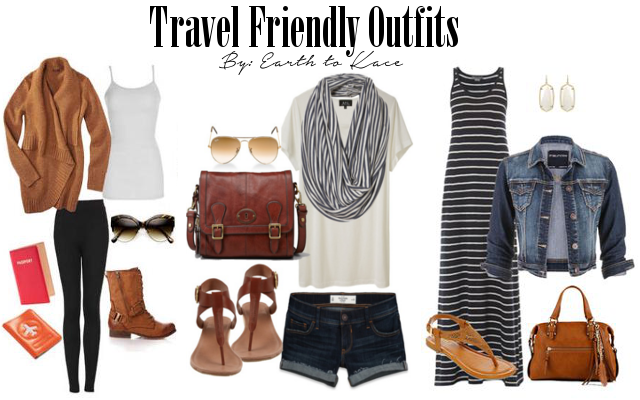 Let me know what your favorite travel friendly outfits are in the comments below! Talk to you when I'm back from the Big Apple (expect a blog post all about it)!